ECHINODERMATA : PAXILLOSIDA : Astropectinidae STARFISH, SEA URCHINS, ETC. 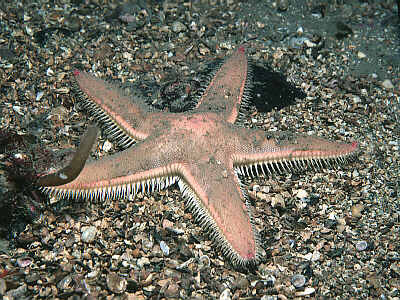 Description: A rigid star-shaped starfish with 5 short tapering arms. At the edge of each arm there is a double series of large square plates and a horizontal row of long pointed spines. The dorsal surface appears finely granular and is sand coloured, often with purple tips to the arms and a purple spot at the centre of the disc. 5-15cm across. Habitat: Usually on clean sand or sandy mud, where it may be buried just below the surface. It may emerge to feed at dawn and dusk. Distribution: Common all round the British Isles. Similar Species: This species is unlikely to be confused with any other, apart perhaps from Luidia sarsi which is much less common and has longer arms and a less rigid star-like shape. Five tapering triangular arms with large marginal plates. Conspicuous spines along edges of arms. Picton, B.E. & Morrow, C.C. (2016). Astropecten irregularis (Pennant, 1777). [In] Encyclopedia of Marine Life of Britain and Ireland.